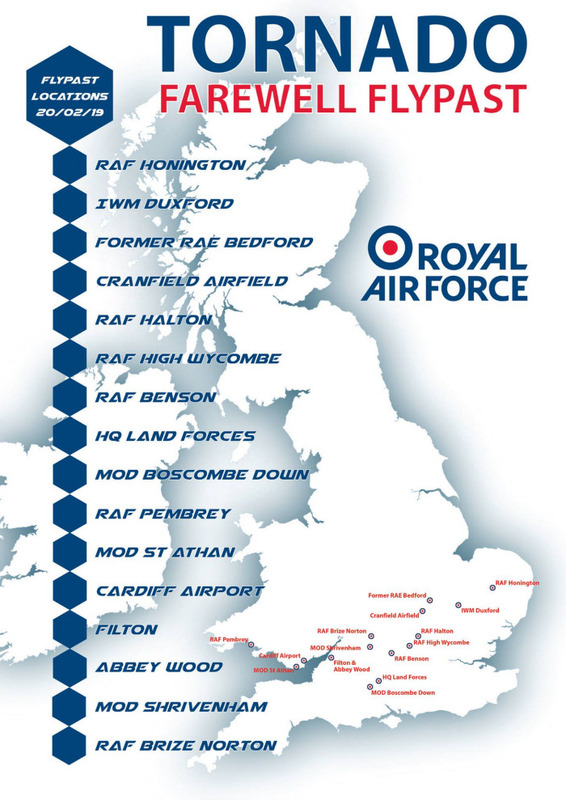 RAF Tornado Farewell Flypast 2019 Times - Military Airshows News & Press Releases. Three specially painted Royal Air Force Panavia Tornado GR4's (ZG752, ZG775 & ZD716) took to the skies on a training sortie which included aerial tanking with a Voyager A330MRRT out of RAF Brize Norton. The Tornado will be retiring on the 31st March 2019 after over 36 years of service in the RAF. Tornado 9-ship flypast from RAF Marham. The formation will conduct a flypast at RAFC Cranwell as well as a series of passes at RAF Marham. ZA587, ZG752, ZD716, ZG791, ZA553, ZA463, ZD848, ZG771, ZA542, ZA601 & ZD744. A 100 Sqn Hawk T.1 (XX198) will be the camera-ship. • NOTAMS - Flight Planning Map: UK. Some 28 years after those first missions to help liberate Kuwait the RAF's two remaining Tornado squadrons, IX(B) and 31 Squadrons, remain on operations in the Middle East fully committed to the fight against Daesh as part of the Global Coalition effort. "I was immensely proud to have led the 'Tail Art' formation, our first event which celebrates the imminent retirement of the Tornado after almost 40 years of service. 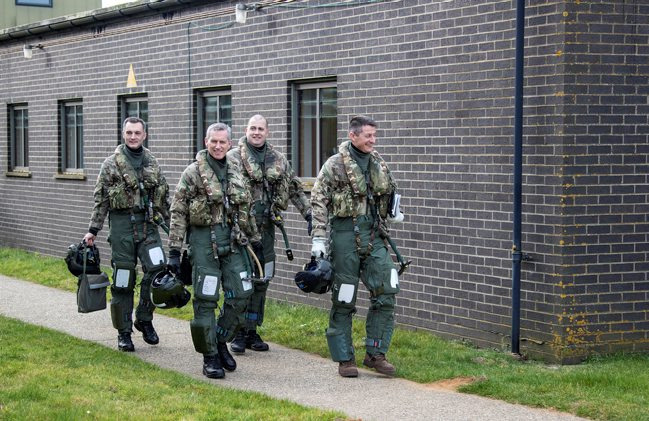 "The success of the sortie was borne out of the outstanding Whole Force support at RAF Marham who remain focused on sustaining Tornado operations and are as committed today as they were in 1982 when the first Tornado landed at the Station. " "I wasn't born when the Tornado first entered service with the RAF. It was a privilege to fly on today's training sortie which also captured fantastic imagery of this iconic aircraft. It will be a sad day for all of us when the Tornado shuts down its engines for the last time." Photos - UK Crown Copyright 2019 - Open Government Licence (OGL) - Wednesday 23rd january 2019. The RAF Tornado will be withdrawn from service on 31st March 2019, and will bring to an end four decades of service, during which the aircraft has formed the backbone of UK airpower. 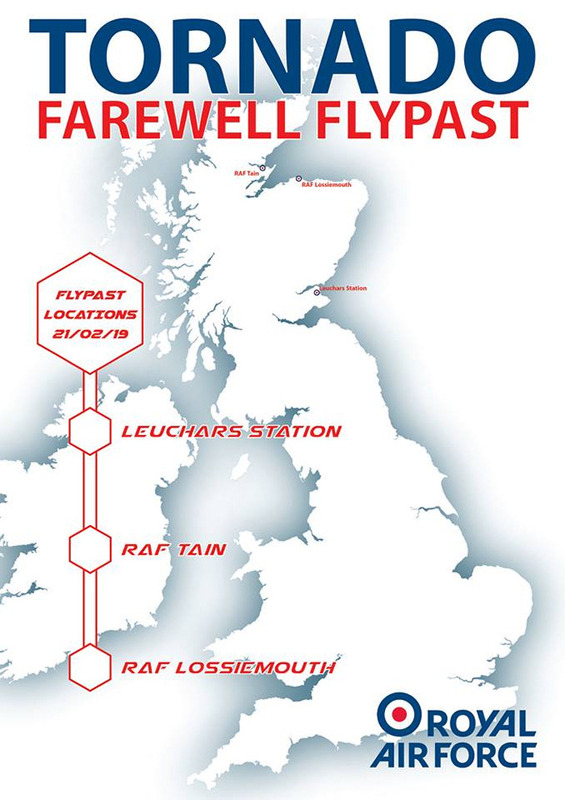 RAF Tornados returned home from Operations for the last time on 5th February 2019. Their last operational sortie took place from RAF Akrotiri, Cyprus on Thursday 31st January. This marked the end of over 28 years almost continual Operational deployment for the Tornado Force. There will be a 3-ship Tornado Farewell Flypast, over three days, from Tuesday 19th February to Thursday 21st February 2019. BTN VALLEY AND WARTON FORMATION WILL CLIMB TO CONDUCT AAR IN AREA 13 (VCY MORECAMBE BAY) UNDER A RADAR SERVICE WITH SWANWICK MIL. • See map showing route for Tuesday 19th February 2019. FORMATION PLANS TO TRANSIT AT 250-2000FT AGL. TIMINGS, HGT AND ROUTE ARE APRX AND MAY CHANGE DUE TO WX OR OTHER REQUIREMENTS. • See map showing route for Wednesday 20th February 2019. Photos - UK Crown Copyright 2019 - Open Government Licence (OGL) - Thursday 21st February 2019. 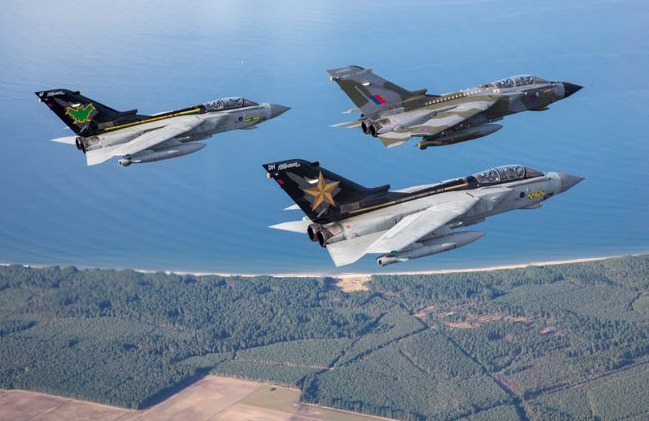 There will also be a Tornado 9-ship flypast from RAF Marham, on the afternoon of Thursday 28th February 2019. The formation will conduct a flypast at RAFC Cranwell as well as a series of passes at RAF Marham. 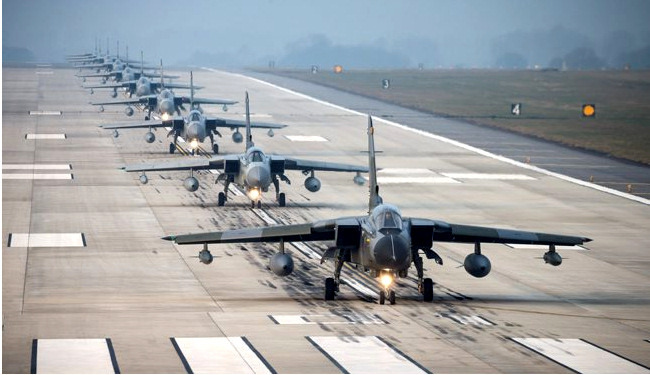 It is expected that 9 Tornado aircraft will take off from RAF Marham at approximately 2pm on Thursday 28th February 2019. 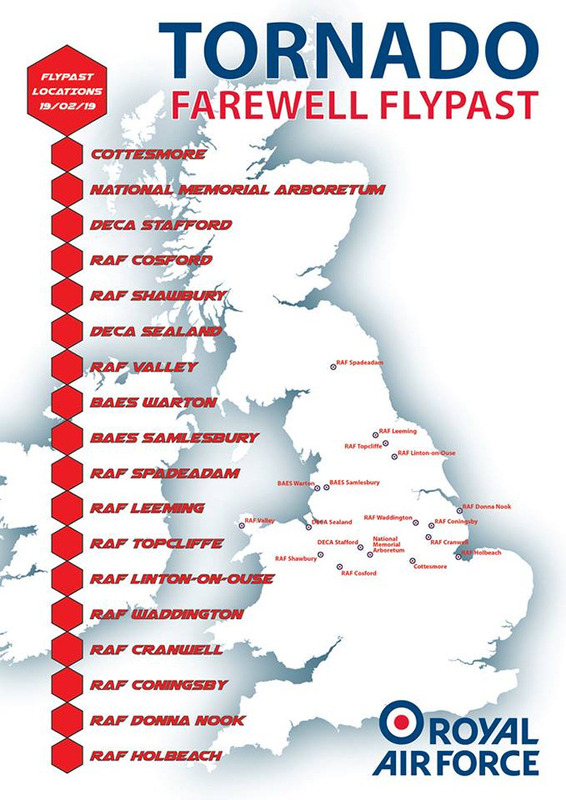 They will perform a flypast of RAFC Cranwell at approximately 3.15pm and the 9 aircraft will then return to RAF Marham at approximately 3.20pm to conduct a series of passes. Photos - UK Crown Copyright 2019 - Open Government Licence (OGL) - Thursday 28th February 2019. 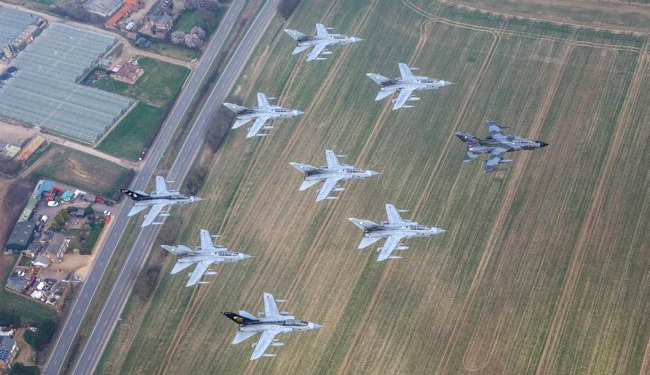 Note that all remaining Tornado Squadrons (IX(B) & 31 Sqn) at RAF Marham have now disbanded on 14th March 2019.